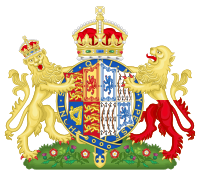 English: HM Queen Elizabeth The Queen Mother (née Elizabeth Angela Marguerite Bowes-Lyon; 4 August 1900 – 30 March 2002), was the Queen Consort of King George VI of the United Kingdom and the British Dominions from 1936 until his death in 1952. After her husband's death, she was known as Queen Elizabeth, The Queen Mother, to avoid confusion with her daughter, Elizabeth II. Before her husband ascended the throne, from 1923 to 1936 she was known as the Duchess of York. She was the last Queen of Ireland (until 1949) and Empress of India (until 1947). Media in category "Queen Elizabeth, The Queen Mother"
This page was last edited on 17 November 2018, at 14:35.